Ulems (Islamic scholars) have always been highly praised in the Muslim world. Every Islamic state was proud of its ulems. Great ulems Abu Khanifa, Malik bin Anas, Hubadullah Sadrushariat, Al-Qazali, Al-Marghinani, imam Maturidi, an-Nasafi, imam Shafi, Kursavi, Mardjani, Ahmad al-Yamani are honored by Russian Muslims. Ever since Islam entered those areas in the 7th century there have been many great ulems in Northern Caucasus. After our forefathers accepted Islam in the 10th century education became a priority and they tried to use every opportunity to educate their children in the best madrasahs of the Islamic world to have native born ulems and kazys (judges). The principle of As-Shura (council) is explained in Koran. Surah Al-Imran (the Family of Imran, 3:153 (159)) reads: “And it is by the great mercy of Allah that thou art kind towards them, and if thou hadst been rough and hard-hearted, they would surely have dispersed from around thee. So pardon them and ask forgiveness for them, and consult them in matters of administration; and when thou art resolved, then put thy trust in Allah. Surely, Allah loves those who put their trust in Him”. The very name — “As-Shura”, council — is the name for one of the surahs in Koran speaking about Mercy of God and stating basics of life of a Muslim. As-Shura as an institution was established upon the last will of caliph Umar to set up a consultation and consisted of 6 companions of Prophet Muhammad (May Allah send blessings and peace upon him). As-Shura elected the third caliph Uthman in 644. Later on Muslim lawyers introduced a theory regulating powers of the caliph and As-Shura. According to the expert on Islamic law Leonid Syukiyanen “The governor should consult on those issues that are not regulated by Koran and Sunna and therefore allow enacting new laws and regulations that don’t contradict general Muslim legal principles. In case caliph doesn’t have the title of mudjtahid (authoritative specialist in law) the decision of the council is obligatory for him to follow. Caliph is in the position to grant the council with law-making power thus making it a legislative body that determines its activity only by the standards of Muslim law and interests of the citizens”. A well-developed conception of as-Shura was first introduced by the Egyptian theologian sheikh Muhammad Abdo who since 1899 was the supreme mufti of Egypt. Muhammad Abdo stood up for the necessity to interpret Koran and Sunnah in accordance with contemporary conditions including idjtihad, supported the reforms of fiqh (Islamic law), and strived for education that is necessary to carry out social and political reforms. To his mind “just power is ensured by three cornerstone basics — liberty, Islamic concept of consultation and a law”. He regarded the very principle of as-Shura — a consultation — as close in nature to democracy and opposite to despotism. “Consultation is a duty provided by Sharia, yet there are many ways to practice it”. According to Muhammad Abdo the activity of as-Shura is maintained by a special advisory body consulting the governor, restricting his absolute power and preventing him from making wrong and subjective decisions. It therefore should consist of representatives of intellectual elite including “outstanding scholars, military leaders and judges, merchants and landowners, heads of associations and companies, party leaders, most talented literary men, doctors, lawyers — those men whom common people trust their troubles”. Thus Muhammad Abdo suggested that as-Shura members should be not only theologians but also intellectuals, representatives of upper social classes, public and political leaders, scholars, military men, judges representing contemporary elite. It is worth mentioning that Muhammad Abdo’s modernistic reformative ideas were very well known to Russian Muslims and many of them were adopted in Russia. Outstanding ulem, mufti of Central Religious Board of Muslims (CDUM) in 1921–1936 Rizahetdin Fakhretdin in his theological treatise Religious and Public aspects (published in Orenburg in 1914) studied the viewpoint of Sunni Muslims upon the reforms provided by the Recent History. According to him Koran and Sunnah are the basic source of legislative regulations for governors. If there is a need to amend the current legislature in can only be performed upon collective decision on the part of ulems, heads of charity organizations, military leaders, lawyers, doctors, merchant and other public men meaning that as-Shura as a legislative body becomes a supreme religious body of Muslim communities in conditions of the Recent History. It therefore should represent a union of all social classes and perform its activity in accordance with conditions of contemporary economy and culture. This very idea was used in 1917 when Millet Mejlise (National Assembly) — a Muslim parliament of Turkic Tatars in Central Russia and Siberia was established to represent social groups listed at the above. Russian Tatars came to use the term as-Shura at the beginning of the 20th century in connection with the Russian Revolution of 1905–1907. In April 1905 Muslim Religious Assembly of Orenburg held a conference of Association of Ulems in Ufa. The idea was processed a year later when in August 1906 the Third All-Russian Muslim Congress was held in Nizhny Novgorod to discuss possible ways to perform reforming of the institution of Religious Board of Muslims. A teacher of madrasah Muhammadiya in Kazan Ahmetjan Mustafa claimed that Muslims needed no muftis or muftiats appointed by the government. What they need was a reform of Religious Board of Muslims and religious schools accompanied by issuing fatwa (laws) ensuring further development of the nation. To carry out this initiative Muslims needed to have a body that would unite ulems, mudarrises (teachers) and politicians. Ahmetjan Mustafa suggested that such body, a council, be in close cooperation with the authorities in order to have opportunity to object to enacting any laws contradicting with the interests of common people. The Council should elect a Chairman General with separate chairmen to head every particular field: ulems for religious issues, teachers for educational issues, lawyers for political and legal issues. Every question should be solved by a majority. In other words it’s been a century already since the idea of a supreme religious body was first introduced. Its most important aspects are cooperation of religious and secular men to solve religious, educational, political and legal questions and cooperation with the authorities to ensure loyalty towards Muslim population of the country. This was only an idea of how such body might function. It became a reality several years later in 1923 when the Second All-Russian Congress of Muslim clergy held in Ufa elected the Council of Ulems — analytical and theoretical body of the CDUM. Among its members there were muhtasibs (heads of clergy) J. Abzhildin (Ufa), G. Gumeri (Astrakhan), Sh. 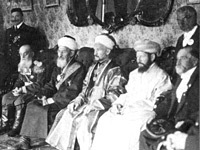 Sharaf (Kazan), G. Rasuli (mufti of the Ural region in 1936–1950), outstanding ulems T. Ilyasi, H. Mahmoudov, S. Hurmanov, M.-S. Hasani, K. Aydarov, H.-G. Gabashi. The main objective of newly founded council was to provide explanation of how Muslims could keep their faith while following state legislature which sometimes contradicted the Sharia. Tatar ulems headed by the great theologian and thinker CDUM mufti Rizahetdin Fakhretdin realized that contemporary reality required to theologically alter traditional approaches of Muslim ummah to many issues of the time including relations with government, reform of religious education, women rights and many others. – setting up intercommunication between the Council of Ulems and Muslim communities. On the 14th of July, 1924 the Charter of the Council of Ulems was passed. Its regulations predominantly concerned legal issues: “The Council of Ulems was founded to carry out righteous decisions concerning fiqh and Sharia that is to explain and show ways for Ummah Islamia (Islamic Nation) to purely keep its religion”. The Charter stressed the independence of the Council of CDUM: “The Council of Ulems is a religious and legal independent organization”. One of the paragraphs of the Charter explained the legal power of the Council: “Council of Ulems is a great all-Russian religious body enjoying finality of decisions. Decisions concerning religious matters are to be followed by every Muslim”. This meant that Council of Ulems and the decisions made were subject to follow for all the Muslim population, not only for Tatars. The Charter also indirectly provided opportunity to control religious and moral behavior of Muslims: “The Council is in the position to regulate religious and moral relations of all Russian Muslims and to resort to persecution if needed”. Naturally it didn’t presuppose punishment of any kind. The form of a boycott was very effective in case it was necessary to influence ideologically someone who didn’t care for simple persuasions. One of the most important documents passed by the Council of Ulems was “The Procedure and the Curriculum of religious courses passed at the Council assembly on June 15–18, 1924”. The thing is CDUM had to focus on finding a way to prepare clergy after madrasahs were eliminated by the Soviet government. In 1920s CDUM and the Council of Ulems proceeded with developing solutions for occurring problems in accordance with the tradition initiated by mufti Rizahetdin Fakhretdin at the beginning of the century. In one of his articles issued in 1924 he proposed to bring Koran and hadiths in correspondence with reality and at the very same time to improve life in accordance with Koran and Sunnah. He stood up for following the Sharia and legal conception of Abu Khanifa based on tolerance to established regime. He also called for closed cooperation between all bodies of CDUM including Religious Congress, ulems, mutawalli (waqf manager), religious leaders. The article of kazy Kashafetdin Tardjemani “Former and present state of our religious organizations” concerning the Charter of CDUM gives us and idea of the structure of religious organizations in the country at that time. They included Muslim Congress, CDUM, The Council of Ulems, Boards of muhtasebs, and of Boards of Muslim communities represented by mutawalllis. Thus the Council of Ulems was a registered lawful body. CDUM covered territories of contemporary Russia, the Republic of Kazakhstan and Ukraine. At the Third All-Russian Congress of Muslim clergy held in 1926 were elected new members of the Council of Ulems: J. Abzhildin, M. Bighy, G. Gumeri, Sh. Sharaf, T. Ilyasi, G. Rasuli, K. Aydarov, G. Kouzembai, G. Tashmuhammed, Sh. Gaisa. It was resolved that mufti and kazys automatically become members of the Council. The Council of Ulems worked until late 1920s when mass persecutions of the clergy started. J. Abzhildin was one of the first Council members to be arrested and exiled in 1928–1932, followed by G. Gumeri in 1929 and H.-G. Gabashi in 1932. In 1930 M. Bighi emigrated. In 1936 Soviet authorities cooked up charges against the CDUM officials and over 30 members of the Council were arrested to make the Council a history. Just like several decades ago today Russian Muslims face the necessity to introduce amendments to theological and legal approach to most vital issues of contemporary world. In this respect the experience of Saudi Arabia could be used as an example. At the beginning of the 20th century Tatar ulems managed to prove that such institutions of the contemporary world as parliament, Constitution, secular education, voting right for women, banking system do not contradict the Sharia. Now at the beginning of the 21st century we are to once more prove that Russian legislature goes in accord with Islamic principles and standards. The body to carry it out is the Council of Ulems. Since we don’t presently have the unified Religious Board the Council of Ulems should become the supreme non-governmental, public and religious organization in the country. The Council of Ulems doesn’t contradict the establishing of unified Religious Board of Muslims. Right on the contrary, to unite ummah we first need to prepare lawful ground and issue necessary fatwas which can only be performed by legislative body like Council of Ulems. It should thus concentrate on discussing and issuing fatwas with further proliferation of the decisions made upon various Sharia issues including worship Allah, family laws, religious education, social and moral problems, etc. Besides the Council should develop a detailed agreement between the government and Muslim ummah of Russia to regulate all aspects of mutual interests including rights and duties of Muslim organizations, development of Muslim education, status of waqfs. The Council of Ulems should consist of two chambers: Religious and Secular. The members of Religious Chamber are Muslim citizens of the Russian Federation with higher theological education who speak Arabic and know the fundamentals of Sharia. The Secular Chamber members are Muslim citizens of Russian Federation with higher secular education who speak several foreign languages and who are in charge regulating relations between government and Russian Muslim ummah. The members of the Council should be elected at large All-Russian Muslim forums like the one planned for November 2006 in Nizhny Novgorod every 3 years. Religious Chamber should be in charge of preparing decision upon specific questions of Sharia in accordance with Koran and Sunnah and should convene every month for issuing fatwas In case fatwa concerning a particular issue already exists the Chamber members study whether it still is applicable in modern conditions. If the opinions of ulems upon any particular fatwa divide the members of the Chamber study the subject of the dispute and give preference to the decision closest to Sharia or announce several decisions with fatwa issued by a 2/3 majority. If the decision still isn’t made the issue is postponed sine die. Religious Chamber doesn’t regulate political issues unless there is an agreement between the government and Muslim ummah of Russian Federation or until its status is legally acknowledged. (This is carried out by the Secular Chamber). The status of the Russian Muslim ummah is of particular importance since Russia entered Organization Islamic Conference (OIC) as an observer state. The members of the Secular Chamber are in charge of any current issues concerning the life of Muslims in Russia with decisions made collectively or by majority. The members of the Chamber gather once in a set period of time. Scholar and public figures of any faith can be advisers for the Chamber. Summing up Council of Ulems might serve as Alkoranic as-Shura in Russia being the supreme legislative and legal body in terms of Sharia. This would provide a unified lawful space for all the muftis, imams and common Muslims combining standards of Russian legislature and Muslim law in terms of hanafi mazhab (legal school). This would make common Muslims stick to existing legislation and at the very same time would deprive Muslim extremists of the ground to claim that Russia neglects Sharia. We believe that Council of Ulems would unite the best of theological and scholar potentials of the Russian ummah to issue fatwas regulating contacts with the world surrounding us.